As court cases often do, Honeywell vs. Rand inspired debate and discussion. Since there was no actual ABC computer produced as evidence (although the Sperry team did construct a "breadboard" model), questions arose concerning what kind of machine the ABC actually was. Some called it a "special purpose" computer, therefore distinguishing the ENIAC and other later machines as "general purpose," and therefore more important to the historical record. John Gustafson wrote in The Quest for Linear Equation Solvers that "even with 18,000 vacuum tubes, the ENIAC could only hold 20 10-digit numbers, fewer than the ABC's 30 15-digit numbers," and raised the question of whether the ENIAC itself could be termed a "special purpose" computer. Others claimed that the ABC was never fully operational, and therefore could not possibly be considered the first electronic digital computer. In order to explore these issues and other mysteries about the purpose and functionality of the original ABC, a team of engineers, scientists, and students at Iowa State University came together to build a reconstruction/replica of the ABC computer based on the records that were available, in particular JVA's writings on the machine during his search for funding to build it and later to patent it. Del Bluhm wrote about his experience with the project and all of the contributors that made it possible in Documenting the ABC Replica Project and its Contributors, published in the Computer Science Department's alumni magazine, Atanasoff Today, in spring 2013. John Gustafson documents the process in his paper, Reconstruction of the Atanasoff-Berry Computer, presented in August 1998 in Paderborn, Germany and later appeared in the Annals of the History of Computing. 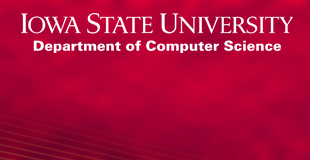 The project was initiated and championed by Delwyn Bluhm, then Manager of Engineering Services at Ames Laboratory, and George Strawn, former director of the Iowa State University Computation Center and Chair of the ISU Department of Computer Science. Bluhm and Strawn obtained initial funding from Charles Durham, a former student of John V. Atanasoff and distinguished alumni of ISU. 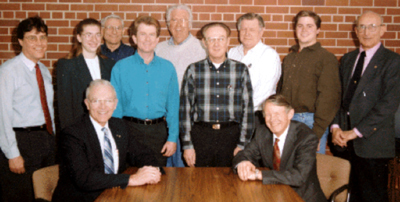 The original ABC was built with a grant from the Iowa State College for around $5,000. The ABC Reconstruction was completed in 1997, and cost around $300,000. Funding for the project was obtained entirely through private sources. Above: Early champions of the ABC Reconstruction project, initated by George Strawn and Del Bluhm. Left: The ABC Reconstruction was unveiled to the public at Supercomputing '96 in Pittsburgh, Pennsylvania, November 17-22. Watch a demonstration of the ABC Reconstruction in action.